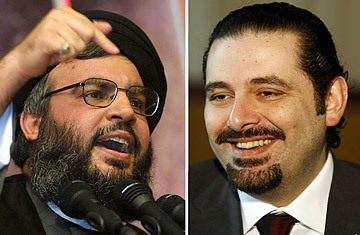 Lebanese Prime Minister Saad Hariri (R) at his office in Beirut on March 16, 2009 and Hezbollah leader Hassan Nasrallah, giving a speech in the southern suburbs of the Lebanese capital July 29, 2002. Few would have imagined, when a massive explosion killed former Prime Minister Rafik Hariri in February 2005, that the aftershocks of the blast would be powerful enough to bring down Lebanon's government six years later. The fragile coalition government led by Hariri's son, Saad, collapsed on Wednesday in a dispute over how to respond to the imminent release of a U.N. tribunal's indictments of those accused of the murder, plunging this divided and conflict-weary country once more into the spotlight of regional anxiety. Lebanon's government is dissolved when more than one third of its 30 cabinet members withdraw, and on Wednesday all 10 ministers belonging to the opposition led by the militant Shi'ite Hizballah movement announced their resignations. Hours later, they were joined by an eleventh minister representing Michel Suleiman, the Christian president, forcing the collapse of Saad Hariri's government. The cabinet resignations, said Labor Minister and Hizballah opponent Butros Harb, "has obstructed matters in Lebanon and further complicated issues". Even as his government was foundering in Beirut, Hariri was heading into the White House to meet with President Barack Obama on Lebanon's political crisis. "The efforts by the Hizballah-led coalition to collapse the Lebanese government only demonstrate their own fear and determination to block the government's ability to conduct its business and advance the aspirations of all the Lebanese people," said a statement released by the White House following the meeting. But it was unclear whether Hariri could expect more than moral support from Washington. Hariri left Washington immediately after his meeting with Obama, and headed to Paris where he will hold talks on Thursday with French President Nicolas Sarkozy, before returning to Beirut. Lebanon's government had been deadlocked on the issue of the international tribunal, which is widely reported to be planning to indict Hizballah members in the killing. Hizballah has denied any involvement in Rafik Hariri's death, and accuses the tribunal of serving the political agenda of the United States and Israel. Saad Hariri, at the head of a fragile coalition put in place in 2009  a year after Hizballah had prevailed in a brief battle for the streets  has faced mounting pressure from the Shi'ite movement and its allies in recent months to declare the tribunal politically tainted and to suspend all cooperation with it. But Mr Hariri, a Sunni backed by Saudi Arabia, has refused to yield, even has he faced an impossible choice: As the son of the murdered former premier, bowing to Hizballah's demands would discredit him in the eyes of Lebanese Sunnis and doom his political career; but maintaining his support for the tribunal risked bringing on a violent destabilization of Lebanon after Hizballah, whose militia remains the most powerful armed force on the ground, made clear it would not allow any of its members to be arrested. The catalyst for the opposition walkout appears to have been the failure of a five-month mediation effort by Syria and Saudi Arabia to find a compromise. Both countries wield extensive influence in Lebanon. The Saudis are Hariri's key backers, while Syria has been a patron of Hizballah and maintained de facto control over Lebanese affairs from 1976 until it was forced to withdraw its military following the Hariri assassination. Indeed, Damascus was initially fingered as the chief suspect in the killing, and has not been absolved even as the accusatory spotlight has shifted to Hizballah in the past 18 months. Many observers were skeptical that the Syrian-Saudi mediation effort could square the circle of conflicting interests over the tribunal. But Mohammed Fneish, a Hizballah minister who resigned Wednesday, blamed "American intervention" for the failure of the Syrian-Saudi mediation effort, and accused Hariri of succumbing to U.S. pressure to continue supporting the tribunal. So where does Lebanon go from here? Analysts say Hizballah's priority is to try and forge a consensus in Lebanon to disavow the tribunal. Lebanese and foreign judges sit on the tribunal and the funding is split between Lebanon and international donor states. The best Hizballah could expect from the most pliant government would be a withdrawal of Lebanese judges and Lebanon's share of the funding, and a refusal to accept or implement any indictments. Such a step would temporarily slow down the tribunal, but it would not kill it off. The tribunal is sanctioned by the United Nations Security Council, which has the power to amend its mandate and continue its work irrespective of developments in Lebanon. But the collapse of the government could herald a prolonged political paralysis similar to the gridlock that prevailed between November 2006 and May 2008. That crisis climaxed with Hizballah and allied fighters taking control of the streets in Sunni neighborhoods in several days of fighting that brought Lebanon to the brink of civil war. Although a compromise deal brokered by Qatar restored calm, Shi'ite-Sunni tensions have simmered. Many Lebanese are now asking whether Hizballah will once again seek to impose its will on the streets. Many expect street protests, isolated outbursts of factional violence and possibly even a return to the assassinations and bombings that plagued Lebanon in the wake of Hariri's death. But even though its military prowess is unchallenged in Lebanon, Hizballah's leaders have plenty of reasons to avoid an all-out war. Still, the anticipation of the Hariri murder indictments is exacerbating already fraught nerves. The tribunal's prosecutors are expected in the coming days to hand their evidence to the pre-trial judge, who will assess whether the case is legally sound before allowing the indictments to be served. Sources briefed on the workings of the tribunal told TIME they expect the indictments to be made public at the end of February or early March. Sheikh Hassan Nasrallah, Hizballah's leader, has said he will not surrender any indicted Hizballah men to the tribunal and has vowed to "cut off the hands" of anyone attempting to arrest them. Some Lebanese leaders argue that the country has to choose between justice for the murdered Hariri or stability for Lebanon. The resolve of those that still seek both may be sorely tested in the months ahead. See TIME's Cartoons of the Week.